Seoul is a world-class city, but Korea’s traditional culinary reliance on meat means it can be hard to find good veggie food. All too often, the easiest thing to do is have pasta or rice based dishes–but if you’re traveling in Korea, what’s the point of having pasta? Here are some great Seoul vegetarian and vegan choices–many of them Korean traditional favorites. A replica ancient gate made from real wood sets the tone for Gosang. Luxury Korean temple food (most of it vegetarian) located in the heart of Myeungdong, this restaurant mixes traditional recipes with an exacting focus on ambiance, presentation, and quality. As you are led to your private dining area, you emerge–briefly– into this faux courtyard. A nice touch. Lunch is available as one of several sets, beginning at 19,000 Won ($16 or so in July, 2016). Dinner has many of the same dishes, but in much more expensive 50,000 Won and up sets. Lunch here is already a special experience, so I would recommend saving the money and sticking with the lunch set. The six side dishes served with the main course. Believe it or not all of the pictured food is part of the set. You get a tremendous amount of food for a lunch special price which is under or around $20 USD, in a beautiful venue. Gosang is amazing and you should go even if you are not vegetarian. Gosang is located on the 2nd basement floor of Center One Avenue. Show this map to a taxi driver or a local to find it. The green 3 and 4 are exits of Eujiro 1 Ga station, while the orange 4 and 5 are exits of Jonggak station, which despite the orange color on this map, is actually the blue line. Here is a Google maps link. Sanchon is a famous Korean vegetarian restaurant. In 1986, the New York Times gave it high praise and the restaurant has never stopped bragging about that. There’s a plaque out front with a copy of the article. Inside, the ambiance was messy and cluttered, but not in in a terribly unpleasant way. Food was very natural, and, in the sense that many of the dishes were strange to my western palette, it’s probably quite authentic. At the very least, it was unique. Meals are offered as sets–there is no a la carte here. Lunch was 30,000 won ($30 or so). Dinner, which includes a performance, is around 50,000 or more. One of the dishes I enjoyed. After many courses which are not pictured, you arrive at this setup, which is what could be called the main course. All those green vegetables in the center look the same–but they are all slightly different. The many dishes at the edges range from pickled to sweet to slightly spicy. Desert was strange. Not sweet at all. Of course, this probably reflects two things: 1) Traditionally, food would not be sweet in a time before refined sugar. 2) This is healthier. If you’re looking for an interesting experience, Sanchon is worth a look. The food is more accessible at Gosang, but this is probably more authentic. Here is a map of Sanchon’s location. Plant is a small vegan restaurant and bakery located in Itaewon. While it’s located in slightly difficult to find location, everyone there speaks English. Their menu changes frequently, so the dishes I am writing about may no longer be available when you read this. This is their burrito bowl, which was very good. With fresh avocado, chips, and a great sauce which was flavorful but not too spicy, this was a treat. Especially in a city filled with Korean food, getting something with a lot of kick, but without Korean flavors was refreshing. Wrap, which was very good. I was amazed that a vegan wrap could taste so good–and I’m a lifelong vegetarian. A few carnivore friends came with me to Plant, and before we walked in, they were joking about needing to get some Korean barbeque after the restaurant since a vegan meal would be insufficient. These jokes stopped once they had some of this wrap. We all liked Plant so much that we came back a second time. Even if you are not vegan, you should go. Plant is sort of hard to find, but I created my own Itaewon map, attached below the next entry. Okay, so this place isn’t Korean–not even close. But, it does have vegetarian options, and most importantly, it is really good. If you are in Korea but dying for a taste of Italy, be sure to look up Pizza D’buzza. You can even go vegan if you make a pizza without cheese. Each pizza is made in a wood-fired oven, resulting in a hot, fresh, and quick pie. This mushroom pizza was FANTASTIC. 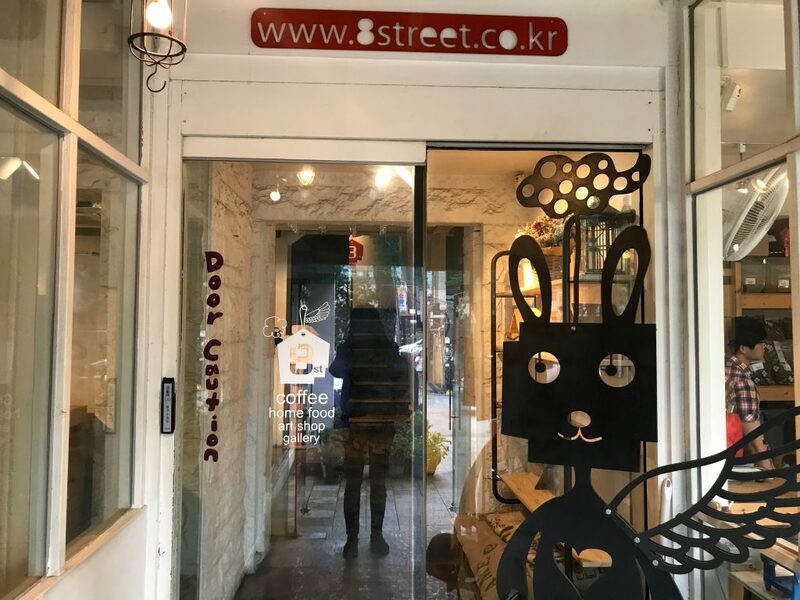 They have four locations throughout Seoul, with two in Itaewon. Check their website for more details. To give you an idea of their location in relation to Itaewon station and PLANT, I created this map. The other locations such as Space Shinseon, Vinyl & Plastic, and Line Friends are all other Itaewon attractions covered in the Seoul’s Special Places article. Sobang Life–known as Sonyeo Bangatgan in Korean–is a small restaurant near Seoul Forest. The owner is young and the food feels fresh and simple. It is as if the simplicity and earnestness of youth is represented by the food. The clean, simple, interior completely matches the vibe. There is a rotating menu which changes based on the day of the week. There are two choices each day–one “vegetarian” and one meat or fish dish. However, after my 5th visit, I was told by a waiter that even the vegetarian one is not truly vegetarian, as the leaves in the rice bowl are cooked with chicken broth. I had not been told this before, but I was glad the waiter told me the situation. I may not visit again, but I decided to keep this on the list only because the unfortunate reality is that most soups, kimchi, and many other dishes in Korea which lack meat are not truly vegetarian, and often have ground meat or some sort of broth. If you are not vegetarian, or not a strict vegetarian, sobang life is still a worthwhile visit. The food changes ever so slightly from one day to the next. To find Sobang Life, check this MAP. I recommend getting off at Seoul Forest station but you could walk from Ttukseom station. If you’re traveling around the world, check out our guides to the best vegetarian restaurants in Hong Kong, Stockholm, Santa Cruz, and Auckland. And if you’re in Seoul looking for things to do, check out Seoul’s 12 must visit destinations and our review of Unistella: Seoul’s Best Nail Salon.